A realist drawing of a man, bent over and on his knees, gutting a large fish and revealing a smaller fish inside. The figure is positioned within an empty black 'stage'. The artist has used a stippled effect overall. 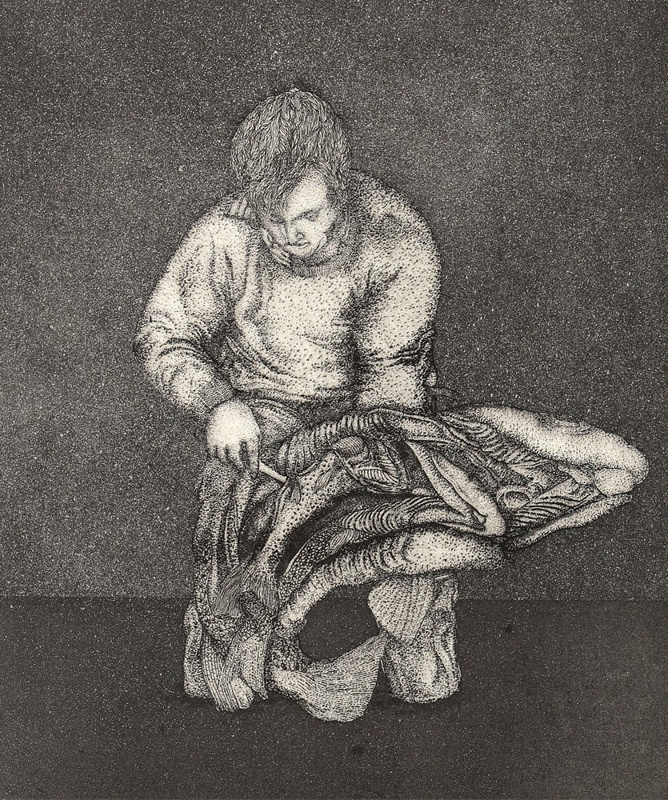 This print is based on a photograph of fellow artist, Trevor Moffitt, gutting a fish. Moffitt (1936-2006) and Cleavin were friends and often went fishing together. Cleavin has adapted the photograph by repositioning the figure on an empty black ‘stage’and also includes a smaller fish emerging from the gut of the larger carcass. The title and image is literal translation of the Latin proverb “Piscem vorat maior mionorem”, which reflects on the relationship between rich and poor.